I dag har vi sett mye av Liverpool. Området rundt Albert Dock er blitt renovert og har mange butikker, samt kunstmuséet Tate og det maritimske museum. Vi var innom begge steder. Det var litt blandet drops på Tate - historie av moderne kunst hadde kjente malere som Picasso og Pissaro samt en god del som jeg aldri har hørt om. Utrolig mye "dårlig" i etterkrigsperioden i henhold til vår smak. Henry Moore hadde en halv etasje til sine skulpturer - litt artig, men også sær og helt utrolig at de er så etterspurt i markedet. Det maritimske museum hadde mye om historien til Liverpool som stor skipsfartshavn, krigsperioden, cruisenæringen, olje og gass, samt en hel avdeling om toll og skatteinnkreving. Etter en kaffekopp og croissant bar turen til sentrum der alle butikkene var åpne - til tross for at det er søndag idag. Vi tuslet rundt i byen i et par timer - Rønnaug i klesbutikkene, jeg litt mindre målrettet. Siden England skulle spille mot Equador i football, fant vi oss en pub med storskjerm, og koste oss med øl og fotballkamp - som England vant 1-0 etter et nydelig mål av David Beckham. Deretter gikk vi til China Town for å spise god kinesiskt mat før vi gikk tilbake til båten. Bildene: Liverpool sett fra sjøen, og inngnagsporten til China Town. We have seen a lot of Liverpool today. The area round the Albert Dock has been renovated, and is a pleasant shopping and reisdential area, also containing the Tate art gallery and the maritime museum. We spent some time in both. The Tate had an interesting display reflecting the history og modern art from 1900 to 2000, with a few painting by well knon artists like Picasso and Pissaro, plus lots of others that we had never heard of (though we are not art-buffs anyway). A lot of the post-war stuff was, to our taste, rubbish. Henry Moore had half a floor to himself - interesting but a little "special" and not our taste at all. Incredible that his works fetch such high prices. The maritime museum was more interesting, have lots of stuff about the Liverpool docks, history of the merchant navy, the war period, cruise, oil and gas and a whole section about customs and excise. After a coffee and croissant, we headed to the city centre and spend a couple of hours looking round the shops. Rønnaug found a clothes shop she liked, I wandered round with no real purpose. Afterwards we found ourselves a pub which was showing the football match between England and Equador on a big screen. We had a couple of beers and enjoyed the match which England won 1-0 thanks to a super goal by David Beckham. 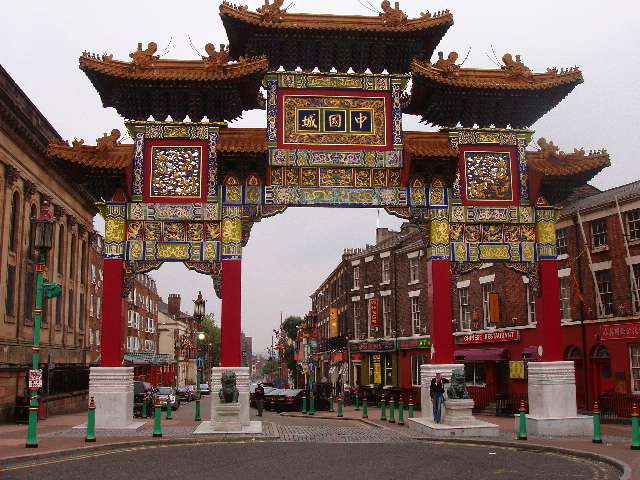 After that we strolled to China Town, and had a lovely Chinese dinner there. We walked back to the boat just before the rain started. 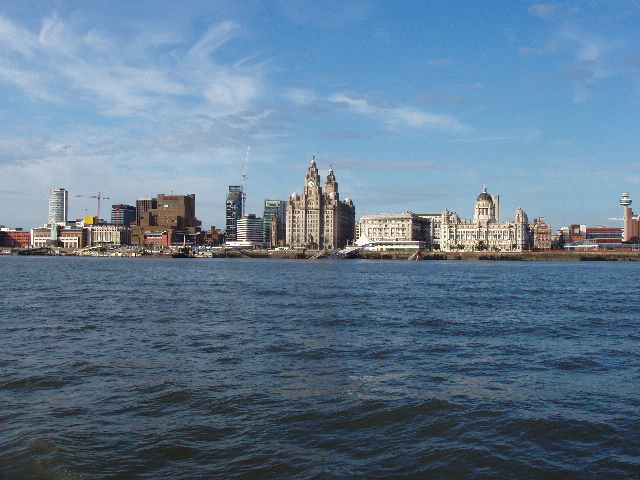 Pictures (above) Liverpool from the sea; the entry to China Town.